We all hate the BBC and its leftist propaganda, not to mention its lamentable programming output, all unjustly paid for via the Broadcasting Tax. So it was sweet justice when the government froze the licence fee and cut Auntie's finances down to size, forcing her to sell off Television Centre. Hordes of vastly overpaid staff were kicked out to the frozen north five years ago, and the landmark building was handed over to developers to improve. What a marvellous decontamination job they've done! Rather than penpushing bureaucrats and so-called acting talent, the former offices round the Helios courtyard now contain prestigious compact flats. "The Courtyard Apartments are a collection of contemporary conversions with underfloor-heated polished screed, windows the full span of every apartment, and sections of ribbed ceiling." 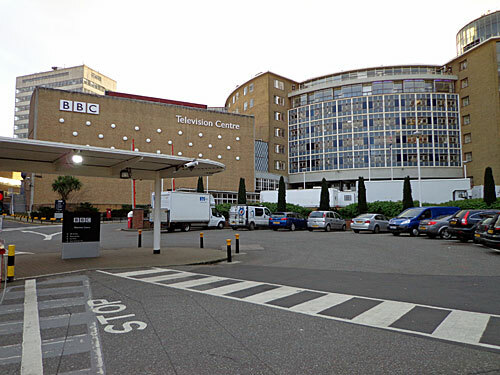 Most of Television Centre's studios were demolished to create a crescent of designer apartments embracing the original core. It's clearly an improvement in every way. 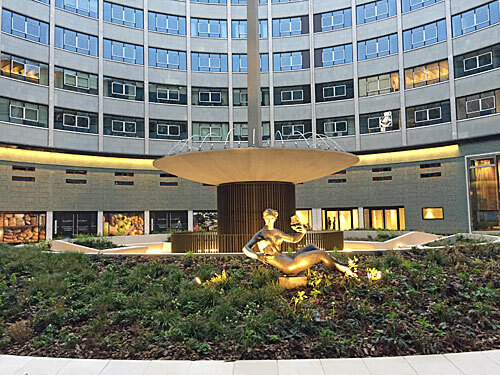 "The Garden Apartments are designed to take full advantage of the landscaped private grounds, while a palette of pale oak flooring and biscuit-coloured terrazzo embodies the clean lines of Television Centre’s original design." Where once the Blue Peter Garden doubled up as every viewer's shared backyard, now only genuine residents with bottomless pockets will have access to the space. "Following the elegant curve between the Helios and the Crescent — a space wider than a London street — a private garden awaits for each resident to explore and enjoy. Imagine living in the middle of a city and waking up every morning to see a lush landscape outside your window." Actual blue chip offices have been added, where entrepreneurs can earn proper money rather squandering our taxes on so-called entertainment. 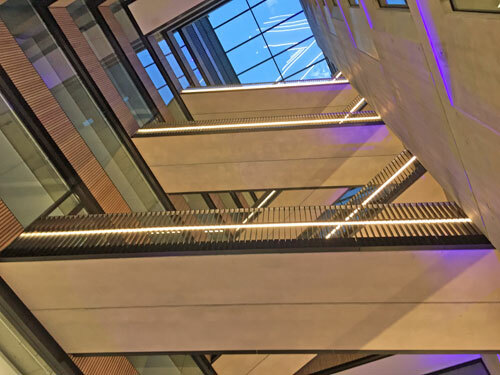 "The office reception sits below the atrium at the centre of the internal street, with seating and breakout areas creating a buzzy and dynamic space with full Wi-Fi coverage and 24-hr concierge. The splayed geometry and staggered positioning of the bridge links make a bold, graphic statement across the atrium, and serves to connect people and activity across floors and between businesses." Rest assured there are no namby-pampy socialist ideals here, only pure unapologetic privilege. "The health club is a new concept called House Gym from Soho House with top range equipment, an 18.5m rooftop pool, steam room, sauna, fitness and yoga studios, and a spa offering residents and hotel guests a full range of beauty treatments." In an act of genius, the private cinema will only show content the BBC either never made, or can't afford to broadcast any more. "A residents’ screening room will show the latest films and sporting events, and will also be available to hire for private screenings." 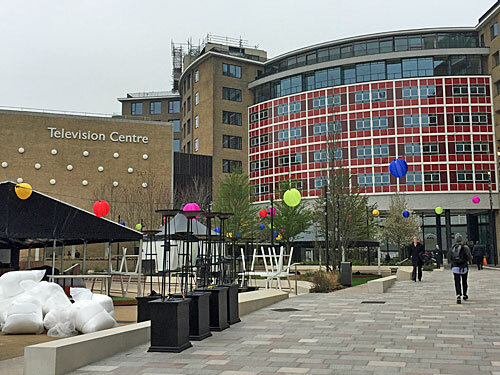 But perhaps best of all, Television Centre's new owners have opened the gates to the public. 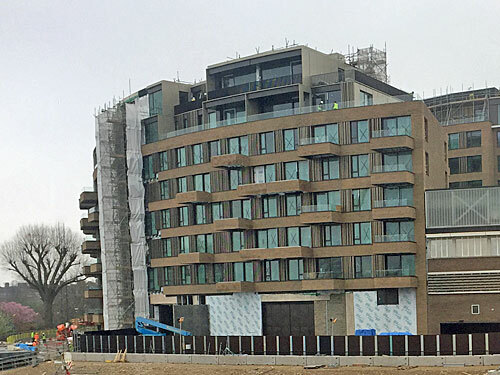 Previously menacing BBC commissionaires kept taxpayers at bay, but now anyone can wander up the stepped recreational terrace and enter Auntie's secret sanctum. Imagine orbiting the central fountain to peruse a ring of retail units, each potentially offering juice infusions, light pasta dishes and unorthodox cocktail concepts. What today's audience really wants is a vibrant culinary destination, not some jumped-up tap-dancing space. And yesterday this is what they got. 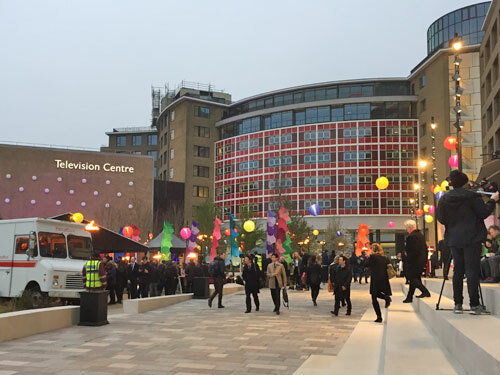 The inaugural Television Centre Festival kicked off at 5pm, bringing foodie treats and a rotating program of DJs to this once-stuffy enclave. It's intended as a showcase for the top-class eateries moving onto the site, from street-sliced pizza to ultra-stacked burgers, not to mention a Conran restaurant and a mixology hub. Pick the right 'test card menu' and you could splash out an entire licence fee in one evening, rather than frittering it over an entire year. The first night certainly drew the crowds, who queued patiently under the awning on the astroturf, and hovered round the meat vans clutching plastic goblets of prosecco. 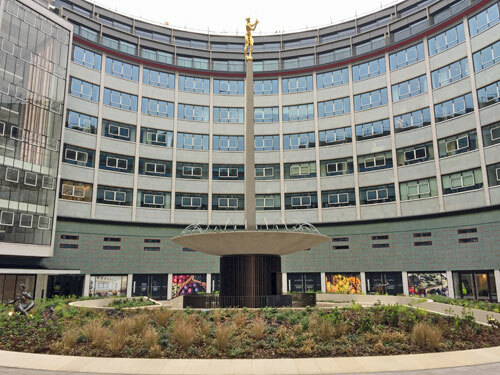 I was particularly thrilled to note that almost nobody was venturing further into the circular courtyard to inspect Television Centre's once-iconic architecture. Millennials are more than happy with alcohol and an experience, so should be the first generation not to fetishise the BBC, which should ensure the Corporation's ultimate downfall. But something had to sour the evening. 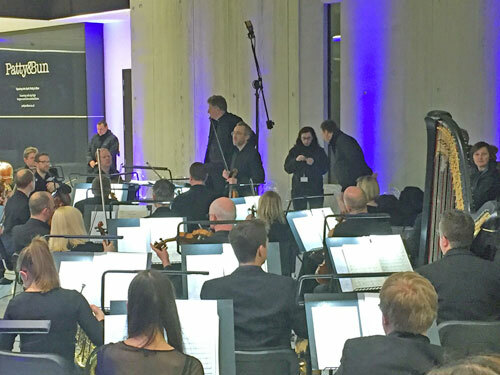 The BBC Concert Orchestra, an obscenely large body of unnecessary civil servants, put on a free performance in the atrium of the revamped office block. Unsurprisingly they kicked off four minutes late. These musical leeches then proceeded to murder a series of light entertainment theme tunes, from some ghastly Welsh version of Doctor Who to the overrated Strictly. Office workers emerging after hours of unpaid overtime paused on the overhead walkways to listen in, then got bored and headed home. Some of the downstairs audience were plainly entranced, jiggling to Grandstand and mouthing all the words to Postman Pat, having been brainwashed by one of the BBC's most dangerous entry-level narcotics. But most members of the Netflix generation failed to recognise any of the older themes and talked all the way through the performance, just as if they were sat at home on their flatshare sofa, confirming that linear television is an irrelevance in modern society. The orchestra won't be playing again and haemorrhaging more public money, thank God, but the festival continues until Saturday night. As well as food, Sarah Malcolm will be hosting a playful vinyasa flow class on mats around the Helios, providing an hour of soft yet fiery yoga practice with a focus on moving with breath and intention. Meanwhile a members' club for women will curate a live podcast, because streaming is the future, while DJ Leo Greenslade spins the decks. I'm sure you'll agree, this inspired line-up features more talent than The One Show has exhibited in a lifetime. Yes, there are still three TV studios on site, where ITV and other commercial broadcasters will share what used to be an exclusively proletarian site. But consumers of Britain rejoice, for Television Centre is no longer a building but a brand, no more a cultural dictatorship but a lifestyle choice. At long last White City is well on its way to becoming a cluster of cool, and the Biased BBC has been well and truly cut down to size.